Edinburgh Doors Open Day is your chance to explore some of Edinburgh’s architecturally and culturally significant buildings - all for free. From heritage landmarks to the city’s newest architecture, Doors Open Day offers free access to properties that are either not usually open to the public and an opportunity to find out more about the capital’s public buildings. Visit our Georgian house on Randolph Crescent and discover the magnificent views of the Dean Valley and the Firth of Forth, the garden at the back, and the beautiful dome. Glean some information about the history of the building and its famous inhabitants, including the Stevenson sisters, along the way. One door down, at N. 12, the office of the Consul General of France will also be open to the most curious visitors. On the other side of New Town, at 28 Regent Terrace, you will also be able to visit the former Free French House officially opened by General de Gaulle in 1942 and precursor of the Institut français and the French Consulate before their move to Randolph Crescent in 1946. The House will be open on Saturday 24 and Sunday 25 September from 2 pm to 5 pm. Unfortunately both venues are not accessible to wheelchair users. 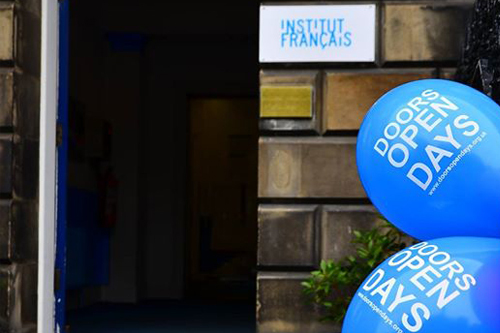 Download the full programme of the Edinburgh Doors Open Day 2016.